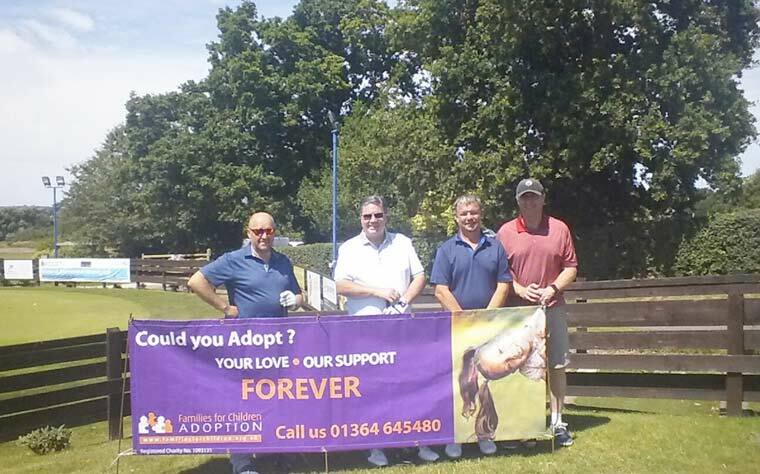 Dudsbury Golf Club Seniors’ and Captain’s Golf Day saw 124 players tee off on 17 July and raise over £2,000 in support of the Families for Children (FFC) newly launched Atrium Centre for Adoption Support. Over £2,000 was raised in support of Families for Children Adoption Agency’s newly launched Atrium Centre for Adoption Support, at a Dudsbury Golf Club Seniors’ and Captain’s Golf Day sponsored by Grove Wealth Management Ltd.
All players enjoyed a round of golf, followed by lunch and a charity raffle and auction, with all proceeds going to the new, pioneering project developed to back up the growing need for adoption support services in the region. She stressed how important it is for adopters to know they have a workable support plan in place and that there is somewhere they can go for help, however small or large that need may be. “Many of the children placed have come from a traumatic start in life and sometimes that history can manifest itself in behavioural and emotional problems as they get older. Whilst in some children these effects are evident immediately and support is offered from the start, for other families it may not be needed until the child reaches puberty or adolescence. The new service aims to target some of the support regularly needed as well as looking at educating those involved in the process including adopters, schools and wider networks,” said Tracy. The charity is currently supporting over 120 families with adoption services and will have to raise £400,000 a year to support the Atrium’s services.